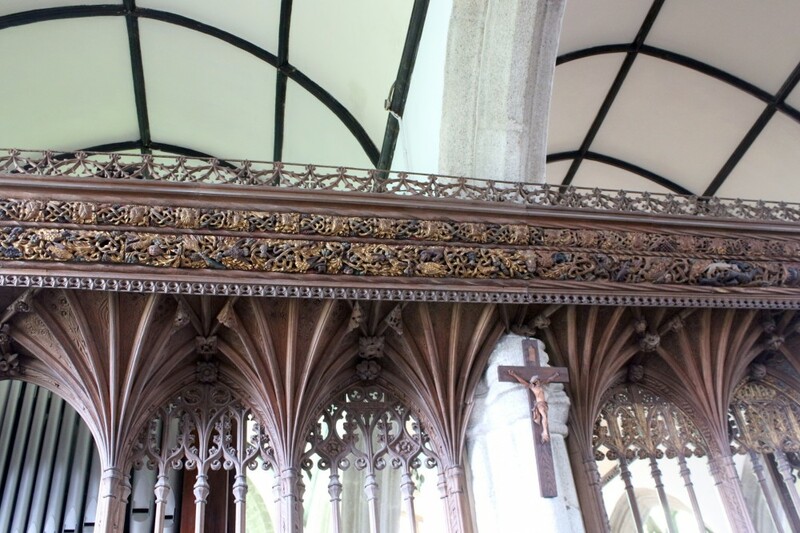 The Rood Screen, is one of the most splendid in Cornwall and even in the entire West Country. It may well have come from a Devon workshop and dates back to medieval times. Judging by the two coats of arms carved on the original beam it was the gift of the Killigrew family and the Godolphins of Boskenna, possibly to celebrate the marriage of John Godolphin to Elizabeth Killigrew in the mid to late 15th century. Their son, also John, was Sheriff of Cornwall in 1504. It is interesting to note that the wood carver has put a dolphin on the crest of the Godolphin shield instead of an eagle displ:sa: perhaps because the Killigrew arms also consist of a double headed eagle. In 1814, when the church was restored, it was cut down and some of the pieces thrown into the tower. Others were stored in a chest in the vestry. 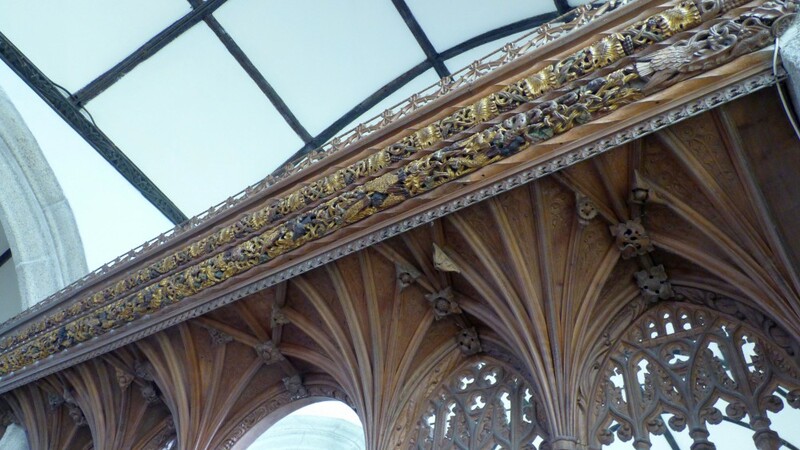 The original pieces of Rood screen that could be found, mostly from the centre section, were gradually replaced between 1880 and 1909 and dedicated by the Bishop of St German's on 7th January 1910. The Lady Chapel section was restored a few years later by Belgian refugees and the Northern end restored in 1922 as a memorial to those who died in the first World War. 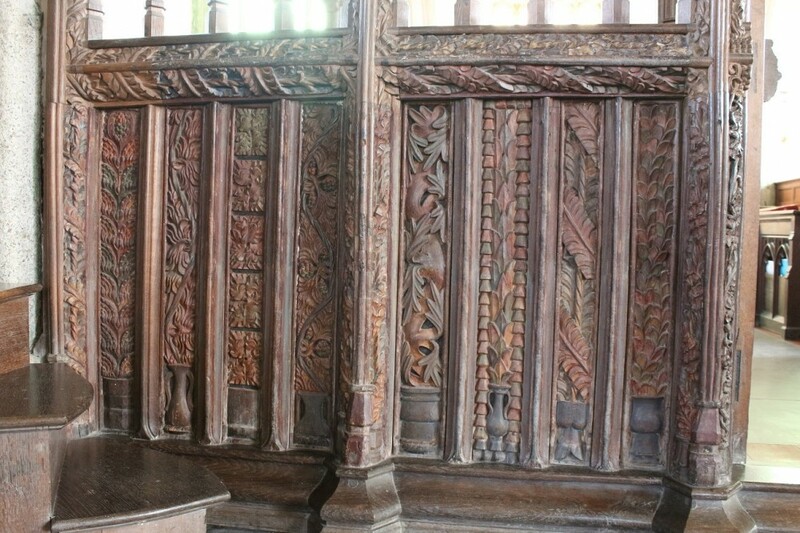 The Lady Chapel section has two completely new bays and one odd panel of original dado, two sections of transom and two posts. Here are to be found a fire-breathing hound and a left hand (whose?). The running ornament is original. The paint on two thirds of the height of one bay of dado and the panel to the right is original. The nave dado is all old except for one panel of the door. There is more original paint on the top two thirds of the right panel of the south bay and the two panels of the south half of the door, on the bottom half of one panel of the north half of the door, on four panels of the second bay from the north and the adjoining posts. Parts of the tracery are also original and rather more than one bay of vaulting panels in the centre. The Aaron's rod on the transom, in the north bay of the nave, has some rare azurite blue paint. There is more blue in the tracery, vaulting and running ornament. Azurite was widely used in medieval painting but it cannot be mixed with oil like other pigments. It was used in a water soluble glue medium which has been destroyed in nearly every screen by washing with water or linseed oil. The running ornament is the splendour and exceptional feature of the Screen. There are two rows between candy stick mouldings; the upper of knotted vines and the lower of fantastic beasts amongst twining foliage. All but one small section is original. The lower trail does not repeat itself anywhere: there are black stags with golden antlers, spotted green serpents devouring unhappy little beasts, greedy black demons stuffing their red mouths with blue and gold striped birds, more gold birds pecking at fruit, and sometimes demon faces stalking them through the foliage, the odd human face, brown and blue cows with gilded horns, a great white hound with a gold collar and two smaller black ones pulling down a black deer with golden antlers, followed by the hunter slipping another hound from the leash, a speckled unicorn fighting with a winged dragon and innumerable other strange fauna tightly entwined together across the entire width of the church. It will be noticed that there is some disagreement about the height of the screen vaulting; the top of the stairs in the Lady Chapel is nearly three feet below the present floor of the vault. It may mean that the original screen was about three feet lower than the present. Acknowledgment is due to Anna Hulbert for details of the screen given in a paper written in October 1975.